Heel pain originates deep within the foot, directly on the heel bone or within the foot's connective tissues, called the fascia. 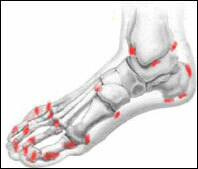 A projection or growth of bone may be called a spur, and can grow where the muscles of the foot attach to bone. While some heel spurs are painless, others that are determined to be the cause of chronic heel pain may require medical treatment or surgical removal (see "Surgical Treatments for Heel Pain"). Follow dosage directions carefully. As with any medication, be aware of potential allergic responses and discontinue use if any adverse reaction occurs, or if pain is not relieved after several days' use. Soak the heel in ice water to relieve pain and inflammation. This works best by placing the foot in a basin filled with tap water, high enough to cover the heel. Allow the foot to adjust to this temperature. Then add ice cubes (two or three at a time) every five or six minutes over a 30-minute period. Soak the foot in ice water three times daily and immediately after any activity. Heat may also be recommended, but ice is usually preferable. If self-care measures do not relieve the pain, the podiatric surgeon may recommend various treatments to reduce inflammation. Some of these may include: · Prescription oral nonsteroidal anti-inflammatory medications to reduce both pain and inflammation. · Cortisone injections · Foot taping and padding · Physical therapy - The podiatrist or physical therapist may treat heel pain with ultrasound, electrical stimulation or hydrotherapy. Each of these methods may help reduce inflammation. · Custom orthotics - A foam or plastic orthotic (custom-made to fit the foot) can often relieve the strain on the tissues and permit the heel to recover. HOW CAN HEEL PAIN BE PREVENTED?